When And We're Off arrived on my doorstep, I was definitely curious to check it out. It sounded like a really great summer read, and with summer quickly approaching it sounded right up my alley. I love a good travel story, especially when it's about traveling through Europe! Seventeen year old Nora has plans to spend the summer before her senior year of high school traveling through Europe to study art and attending a very exclusive art program. Everything is going exactly as she planned, until her mom decides at the very last minute to go along on the trip with her. And so, there goes her summer. I found the characters in the book a bit hard to relate to. I understand that Nora was disappointed that her trip wasn't to go as planned, but she was a bit overdramatic about it at times. And the mom was just really annoying. Being a mom myself I can usually relate to the moms as well, but not this time. I get wanting to spend time with your kid, but she just went about it the wrong way. I kind of expected their relationship to grow throughout the story, but I feel like that never really happened, unfortunately. This book was a really quick read. I quickly became engrossed in Nora's adventure through Europe. I absolutely loved the setting for the book the most. I would LOOOOOOOOVE to travel through Europe, and one day I hope to actually do so. Not that it will be happening anytime soon, however, so I'll just have to fill the void by watching lots of foreign movies. *grin* I really did love the setting. The descriptions were great, and totally made me want to be there right along with Nora on her adventure. 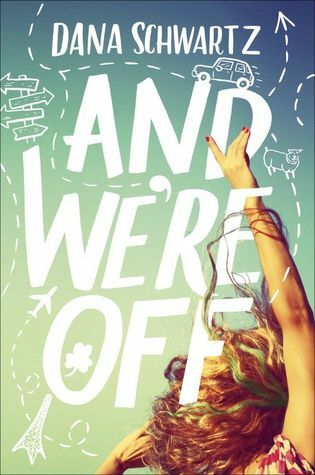 Overall; And We're Off is a quick read that will be great to add to your summer reading list. If you're a fan of books with travel in them, you'll definitely want to check this out.